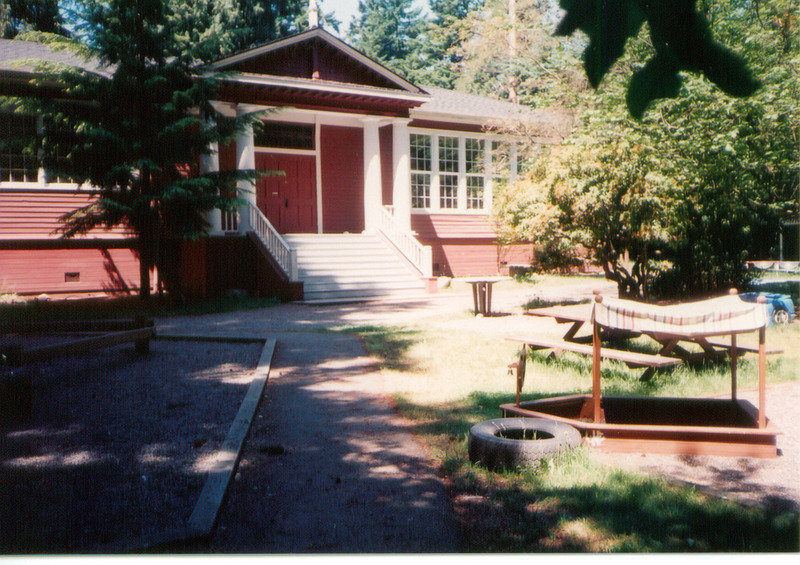 The following stories are an informal account of the wonderful years I enjoyed teaching with Nuki Fellows at The Sunnybeam School on Mercer Island, Washington. Nuki was one of the best teachers with whom I have taught. She totally understood preschool aged children and gave them a beginning to their school lives that many will never forget. Graduates often came by to see her and to find themselves in the annual school photos pinned to the bulletin board. In fact, when I was teaching at the Pacific Science Center in Seattle prior to teaching at Sunnybeam School, I discovered later that the captain of the large sailing ship we were on while taking weekend marine education classes, was an alumnus of Sunnybeam School! Pins on a world map that was attached to the school bulletin board showed where Sunnybeam graduates lived or had traveled to around the world. These items alone set this little red schoolhouse on Mercer Island apart from all the rest and gave me to know that when I walked into the school to meet Nuki for the first time that this was a very special place. So let me start from the beginning of the story. In the summer of 1981, I had mentioned to my sister (Cynthia Howe who lived with her family on Mercer Island) that I was ready to leave the Pacific Science Center so that I could once again teach in a school setting. I had taught pre-school and kindergarten at Helen Bush School in Seattle and was looking for another pre-school position. Cynthia’s eldest daughter, Beth, had recently graduated from Sunnybeam School. Beth and Cynthia loved the little red school and knew that the owner/head teacher of the school, Nuki Fellows, was looking for a teacher to start in the fall. So a job interview was set up and I arrived at the school to meet with Nuki. It was the most memorable job interview I had ever had because I was hired on the merits of — not myself — but those of two dogs! As Nuki and I chatted at the top of the big steps that lead to the school playground below, Nuki discovered thatTupper, the mother of Nuki’s English Sheep dog, Winston, had visited my classes every day when I taught at the Bush School. Upon hearing this, I was hired on the spot. This was the way Nuki ran her school and the reason the children (3 to 4 year olds) their parents and I were so very fond of this woman. She was generous, smart, fun-loving, had a twinkle in her blue eyes, had a big smile, big heart, big voice when needed, and was in tune with people, especially little people. She knew how to make them feel at home, cared for, what the rules were and gently solved disputes between youngsters while making their day fun, fulfilling and wanting to come back the next time. Because the school philosophy was based on experiential, hands-on learning, children needed to feel comfortable about wearing pants, digging in the dirt, playing with old toys, going for walks in Pioneer Park woodlands and playing outdoors. If a child was uncomfortable with this, they soon learned that it was alright to get dirty in the Archeology digging pit or climbing on the metal climber, rocking on the outdoor rocking horse and playing in the old rowboats in the yard or climbing the slide and whooshing down it. When they saw Winston whoosh down the slide, they wanted to do the same and soon forgot about getting dirty. Winston often came to school which was a great comfort to children who were having a “bad day”. They could curl up next to him. He was big, furry, soft and gentle. He also brought pumpkin seeds for everyone in his saddle bags for Halloween. He brought goodies for everyone in his saddle bags at Christmas. And he brought little Italian Plum plants for everyone in his saddle bags on May Day. He was very much a part of the Sunnybeam school day as was the Saddle Club’s tiger-striped stable cat who visited daily and draped itself over the laps of the children during the daily “circle time”. The Sunnybeam School year began in the fall right after Labor Day and ended Memorial Day weekend. The four-year-olds came to school in the mornings on Mondays, Wednesdays and Fridays. The three-year-olds came to school on Tuesdays and Thursdays. When we offered a transition class in 1982-1983, the five-year-olds who were too young to enter public school kindergarten, came to school every afternoon. Most of these children were boys with the exception of one girl. We focused on science, particularly astronomy. We hired an assistant teacher, Leslie, to teach with me. When the children arrived at school in the morning, they were gathered at the back porch until everyone was accounted for. Then we went into the classroom where children hung up their coats in their decorated lockers. Each child had his/her own locker for clothing and “Show and Tell” items. The lockers had been painted by an artist named Tami who lived on the Island. Her colorful paintings included: animals, people, flowers, toadstools, mushrooms, elves and fairies —- things little people love. She had also painted the same wonderful decorations on the doors and walls of the building. In the Big Room, next to the classroom, she had painted bouquets of flowers, little people under an umbrella, elves and other fun images. There was even a dog that looked very much like Winston. Once the children had hung up their outdoor clothes, they sat in small chairs in a circle. This was “circle time” in which we discussed topics of interest, shared experiences, learned to listen to one another and to raise one’s hand and wait to be called upon, if one wanted to speak. This was also a time when children had the opportunity to bring an item to school to talk about to the class. This was their “Show and Tell” time. However, there was one item that was not allowed — a gun of any kind. Children were not allowed to bring toy guns to school or even to make one out of sticks and other items. It was fun for everyone to see what other children brought, and this activity encouraged everyone to share, speak to a group and learn language skills. We also noted the date and weather on the wall calendar, or read a story. After “Circle Time”, there was free play in which children could put on aprons for painting at the standup easels, play with blocks or table games, look at books, play with the doll house or play house in the small kitchen area. This activity time was followed by outdoor time in the school play yard. The play yard had trees to climb, digging holes to excavate, a spring rocking horse, the climber, a rocking boat toy, big wheels, wagons, tricycles, real wooden rowboats, rubber truck tires, hobby horses and so much more for creative play. The toys were stored under the school and brought out and put away each day. The children helped to put the toys away, after which they lined up to sing a song before they went inside. Whenever we changed activities, we often did so with a song created by Nuki or from a songbook. Singing was very much a part of the Sunnybeam day. A few of the songs are: You Are My Sunshine; Love is better if you give it away; Itsy Bitsy Spider; Let a Tree Be Your Umbrella on a Misty Moisty Morn, the sun will soon be shining and you will not be forlorn; An Owl Sat On the Limb of a Tree. Upon reentering the school after outside playtime, the children went to the tables, sat in the small painted wooden chairs and waited while Nuki and I passed around the apple juice and crackers to each child. Before eating, we all said the following poem together: “Thank you for our Sunnybeam school. Thank you for the golden rule. Thank you for our work and play. Thank you for our treats today.” If someone had a birthday, their parents brought birthday treats to school such as cup cakes. We all sang Happy Birthday to the birthday child. It was great fun and everybody looked forward to birthdays at school because of it. After snack time, there was a guided activity in which the children made an art piece or something to take home. In the fall, it often had to do with leaves. In the winter, it might have been snowmen, snow scenes, snow flakes, tree branches cut out or drawn or pasted onto colored paper. In the spring it often had something to do with flowers, fluffy cotton clouds, rain drops, butterflies and seeds. Following the guided activity, the children lined up to go home. They returned to the back porch to await their rides and to say good-bye for that day. There was such a wonderful close family feeling between the children, teachers and parents that we always felt sad when the year ended and we had to say good-bye for that year. It was a comfort to know that most of the three-year olds would return in the fall. And so the Sunnybeam School family would continue, as it had for many years. However, in the spring of 1984 Nuki had decided to retire after the school year was over. So we had a big retirement party for her and invited all the alums. It was really fun to meet so many alums who simply loved the school and had so many nifty stories to tell. Because Nuki was retiring, I decided to return to the Pacific Science Center. I had also become engaged to Steve Williams, who had loaned us his Indian teepee for the kids to play in, and was the first and present Park Manager of Luther Burbank Park on Mercer Island. We were married May 5th and had our wedding reception at Sunnybeam School. It was such fun! The children, their siblings and parents were all invited to come. We sang many of the Sunnybeam School songs just before cutting the cake. Nuki and her sister, Lee, made all the beautiful flower decorations and two of our parents who were caterers, made and presented all the yummy food. Steve played French horn with a group called, The Bavarian Village Band, who played german band music and dressed in lederhosen. They played the music and we all danced in the schoolyard. Nuki was afraid that if we danced in the Big Room, the floor might collapse. We had been told that the foundations were rotting and badly needed repairing. Sunnybeam School had wonderful seasonal holiday traditions probably created by Nuki and her former teaching partner, Eleanor Wolf, who had sadly passed away just before I was hired. The autumn brought Halloween. What a fun time for our students. They loved making cat and pumpkin art. The witch who sat on her broom that was hung on the wail, looked down at everyone. And when the day came to celebrate Halloween, the kids came to school dressed in costume. At “Circle Time” that day, each child paraded around the circle to show and tell about his/her costume. It was fun! At snack time, I jumped into the big wooden armoire, that stood at one end of the classroom, while the kids and Nuki were outside at recess. As soon as the kids sat down for their snacks, I rapped on the inside of the door of the armoire. Nuki acted very surprised and wondered who could be knocking on the armoire door. The children were quiet as could be. Then one by one they began to suggest who it might be: Winston?, one of the dolls?, a visitor?, the barn cat?, and then Nuki pointed to the empty space on the wail where the witch on her broom had been. At that cue, I poked a note attached to the broomstick through the crack of the slightly opened door. It was from the witch to the children!! Nuki read it. It asked the children to stay in their seats because she (the witch) was very shy. The note invited the children to look for a gift from her to them. She had placed the package in the Big Room. So off they went with Nuki to look for their gift while I crept out of the armoire and went around the outside of the school and met them in the Big Room. There was great excitement as they looked for the orange package. Once found, they all crowded around to see what was inside. When the package was opened up, there were pumpkin seeds for the children to take home and plant. We talked about how they could grow the seeds and have their own pumpkins next year. Each child got a ziplock bag in which to carry their seeds home. After that, we returned to the classroom to munch on cooked pumpkin seeds, crackers and juice. There was a lot of chatter and laughter, as you can imagine. In November we celebrated Thanksgiving. Each year Nuki visited a turkey farm to get real turkey feathers. They were sleek, glossy with a greenish sheen, soft and just right for making the traditional pine cone turkeys for each child to take home the day before Thanksgiving vacation. The turkeys were made with orange pipe cleaners shaped to form the head, gobbler and two legs to stand on. The legs were stapled to a stiff piece of paper so that the turkey would stand up. The pine cone was from a lodgepole pine so was just the shape of a turkey’s body. The feathers were secured with a drop of glue between the opened sides at one end of the cone to form the tail. The pipe cleaners were wrapped around the other end of the cone to form the head and gobbler while the legs were formed by wrapping a second pipe cleaner around the middle of the cone and twisted under the belly to secure the pipe cleaner and form the two legs. It was very clever and children still have those turkeys to this day. One year when we were making the turkeys, Nuki had placed the box of feathers on top of the low row of lockers. When she was explaining to the children how to make their turkeys, she was looking at the children seated at the tables and had reached into the feather box to get a feather to show. All of a sudden there was a loud yelp from her. Everyone was startled and looked at her with wide open eyes. It was so quiet, you could have heard a pin drop. Then she began to laugh with her wonderful hearty laugh as she pulled the barn cat out of the box . The cat was covered with turkey feathers. It had jumped into the box as any smart cat would do. It was cozy among the feathers and may have thought it would catch a nice fat bird in that box. In any case, when Nuki reached into the box she had felt a warm, furry body, not feathers. This was the cause of her loud yelp. The cat seemed unperturbed except it seemed a bit miffed that it had been disturbed. Nuki gave it a feather to play with and we all had a good laugh. I am sure little voices carried that story home for others to enjoy. Christmas was a big event at Sunnybeam School. And such fun. The school was transformed into Holly Farm for the weeks between Thanksgiving and Christmas. The outside wall facing the playground was decorated with a large Santa in his sleigh with the reindeer. Life - size snowpeople stood against the fence posts. The play yard became a forest of Christmas trees that the kids loved to play around. The Big Room became the center of activity as visitors came to buy homemade items, holly and evergreen wreaths, boughs, ornaments, preserves and Christmas trees. I was usually left to teach in the classroom while Nuki, her sister Lee and others sold trees and other items to buyers. Nuki put on her foul weather yellow slicker in order to help place the trees around the yard when they arrived by truck. Then she continued to help buyers pick the tree that was just right for them. Many of the buyers returned every year to Holly Farm. The little red school was filled with the holiday smell of those fragrant evergreen trees and boughs. In the classroom, we made cotton snowmen, snowflakes, Christmas cookies with the use of the oven in the kitchen and colorful paper chains. The children each painted a pane of the large glass windows. They stood on the shelves below the windows in the classroom and used yellow, green, blue, red, orange and purple tempera paints to paint their designs and to put their name on their pane of glass. It was such fun and made the room look very festive in readiness for the upcoming Christmas party. Even the large doll house (the classroom home for the school’s famous and much-loved grey, lop-eared rabbit, Mr. Houdini) was moved and decorated. On the day of the Christmas party, Nuki and I dressed in our holiday best, as did the children. The parents were invited to arrive for snack time. But before that, the drama began. My job was to carry a small evergreen tree we had cut, into Pioneer Park which was located just across the street from the school’s driveway. I was to go a short distance down the trail, stand the tree up and place our Christmas elf doll on top of the tree while the children were absorbed in other activities. Then I needed to get back to the classroom before the children came in for snacks. Once again I was to whisk into the armoire with a note from the Christmas elf inviting the children to go to the forest to find the tree upon which he would be sitting. They could use this tree for their Christmas party and put the decorations on it that they had made. Thus, after recess the children came into the decorated classroom and sat down for snacks. All of a sudden there came a knocking from inside the armoire!! Once again Nuki looked mighty surprised and asked the children to listen. What could that be??? They all had suggestions. On cue, I slowly pushed the note through the crack in the door. With great surprise and drama, Nuki slowly read the note to the children. It was then that they noticed that the Christmas elf was not above the dollhouse. So they decided that he must be waiting for them in the forest. Each child put on her/his coat, hat and boots and stepped into the line of children to go outside. As soon as they left the classroom, I rushed out of the armoire (it was getting a bit cramped in there anyway), grabbed a small saw and joined the back of the line of children. We crossed the road and headed into the forest. There was much discussion and anticipation as to where the elf might be. We looked up, down and sideways as we moved along the trail. Suddenly one of the children shouted, “I see the elf” and pointed in the direction of a small tree in the woods. Sure enough--there sitting at the top of that small evergreen tree was our Christmas elf. I had brought the saw so I proceeded to “cut” the tree down accompanied by hopping up and down, shouts, squeals of delight and giggles from the group. Then we had to decide how to carry the tree back to school. I held onto our Christmas elf while Nuki placed children along the tree from top to bottom. Each child held a branch of the tree as we walked it back to school while singing Christmas songs. Unknown to the children, their parents had been invited to come to school while we were in the forest. They had arrived and were waiting with cameras poised as we marched up the driveway to the front door of the school. Suddenly the tree took a lurch forward and the singing stopped. One of the children at the front of the line had stepped into one of the many potholes in the dirt driveway and had fallen on top of the tree. Everybody stopped. There might have been tears, but Nuki in her ever-understanding way, gently brushed the water and dirt off the fallen child and pointed to the waiting parents. All was forgotten and the group broke into shouts of glee and we continued to carry the tree onwards and into the classroom. Once inside the school, the children put their outside clothing into their lockers and helped to place the tree in the tree stand. Next the children with their parents/adults trimmed the tree. There was much excitement as children showed their adults which ornament each had made. After the tree was decorated, the children sat on the floor around the tree and Winston appeared wearing green and red saddlebags filled with fresh oranges: one for each child. He was always a hit. He proudly sat with the group while we sang Christmas songs around the tree. It was like magic and such fun. Our kindly parents always clapped even when we sang off key. After the singing, each child took her/his orange and sat at one of the decorated tables. Nuki and I passed cookies and juice to everyone and together we said our Sunnybeam Treats “thank you” poem. When the cookies and juice had been eaten, the children got ready to leave. We all wished each other a very Merry Christmas and a Happy New Year! It had been a fun day and Nuki and I were looking forward to seeing our nifty parent group and the children back in school in the new year. This was a special occasion and big party because we combined the 3-year olds group with the 4-year olds. The New Year brought the children back to school with more Sunnybeam adventures and holidays to enjoy. Valentines Day was always a favorite. We made paper hearts and decorated the classroom with many of these. They were taken home on the day of the Valentine’s Day party. On that day, the children brought a valentine for each of their classmates. When they arrived at school, they put the bag with their valentines in their lockers and were not to touch them until it was party time. There was much whispering about what their valentines looked like and the surprise each of their classmates would have when their valentine was dropped into their classmate’s decorated valentine shoe box. We had spent the previous weeks collecting shoe boxes and decorating them. When finally it was party time, the bags full of valentines came out of the lockers and each child took his/her bag to a seat at the tables. One by one, the children dropped the unsigned valentines into the red and white decorated “mail boxes” at each child’s place. Then the opening of the boxes began and what fun it was! The chitter, chatter of little voices, giggles, and squeals of delight filled the room while Nuki looked on with a big smile on her face and I enjoyed it all. After all the valentines had been looked at, they were put into the boxes which were placed by each child in his/her locker. Once the children were seated back at the tables, we said the Sunnybeam Treats “Thank You” poem (as we did before every snack time) and the treats were served. Can you guess????? they were usually homemade cookie hearts. Early spring brought Easter. Nuki was a Master Gardener, so spring was always a special time for her with new growth, budding branches and flowers. Easter was a colorful time and we got to play outside in the play yard more often, rather than inside in the Big Room which often happened during the cold, wet winter months. For Easter, the children made white (with pink inside) rabbit ears attached to a brown paper headband. A piece of white cotton was stuck to a long piece of scotch tape to form the cotton tail of the rabbit. The tape was hung from the waistband of each child. On Easter Party day, we hopped around the school like Mr. Houdini, our school rabbit. He was especially popular that day. During snack time, the children wore their rabbit outfits which they took home. It was a fun day for everyone, and mostly for Mr. Houdini who joined the children during Show and Tell circle time. Mothers’ Day was a time when just the mothers came to school for a visit and snacks. The children made a gift for their Moms which they took home after the party. For May Day, Nuki brought small shoots from her Italian Plum tree (Prunus, prunus). The tree was special because it bore delicious fruit and had purple leaves. She also brought lots of flowers from her garden and put them in water in a big tub that she placed in the classroom. During the party, Winston brought the small shoots for the children in his saddle bags. It was a beautiful time and anyone who wanted to bring flowers to school for others to take home was welcome to do so. They also took home some of the flowers Nuki had brought. I have talked with former students who received their Prunus prunus shoots and had planted them. They said the tree (s) had grown tall. Through this tradition and others, Nuki taught children to be aware of nature and things organic. “Organic” was a central theme of this small school that taught children to dress to play outside in all kinds of weather, dig in the soil, conserve natural items, respect one another and learn science and basic skills —- not reading or writing, but prereading, pre-writing and experiences upon which to build a vocabulary and understanding of their world. Sunnybeam was a perfect name for this school because I cannot remember any child going home unhappy. We always made it a point to talk with a child who was feeling unhappy, find out why and figure a way to make it a happy day for that child before she/he went home. School was a Sunnybeam place--a happy place for little people. The last day of school was always a very special day because each child brought a sack in which to take home all the things in her/his cubby/locker and a sack filled with goodies for a picnic snack. We started the day in the usual fashion with Circle Time followed by play time. However, the rest of the day was spent walking a particular trail in Pioneer Park that lead to an overlook into the valley of the park. There, under a big old tree, we gathered to enjoy a picnic snack. There was much excitement as Sunnybeamers decided where they wanted to sit, the fallen tree trunks they wanted to climb on, the bird songs and of course--comparing one another’s snack bag contents. We sang our Sunnybeam songs for the last time that year and then headed back along the trail to school where we hugged good-bye and the children were picked up at the back porch by their parents, it was an exciting day and also a wistful day as Nuki and I sat on the top step of the big stairs that lead to the play ground below. We had often sat there during the year as we kept an eye on the children, solved the problems of the world and invited visitors to join us. On the last day of school, we sat on those steps once again as we reviewed the past year. We laughed about happenings such as the cat in the turkey feathers and thought about ways we could have done better in other instances. One year we got such a giggle out of the time little Jennifer fell out of the small pine tree near the foot of the stairs. Nuki and I were at the top of the steps and heard a loud thump as she hit the ground. We could tell that she wasn’t really hurt, so when she looked up at us and was about to cry, Nuki’s loud and gentle voice boomed out across the play yard saying, “Why Jennifer you just discovered--GRAVITY!” Little Jennifer was so enthralled with the idea (not knowing what Gravity was, but it sounded good) that she picked herself up and whisked off to join her playmates. We knew we would miss those little voices during the summer and looked forward to greeting them again in the fall. However, one summer older children’s voices were heard around the school when I managed a Marine Education camp for the Pacific Science Center at Sunnybeam school. It proved to be the perfect venue for an outdoor camp. After Nuki retired and I returned to work at the Pacific Science Center in 1984, the school sat empty for a year or so while a group of parents worked to open up the school again. My sister, Cynthia Howe, whose three children (Beth, Emily and Nat) attended Sunnybeam, was part of that group. She also worked with Nuki to have the school and the adjoining teacher’s cottage placed on the National Register of Historic Places. Nuki worked with the new Board of Directors to move the school forward. And today (2017) the school is open and running thanks to the efforts of some very dedicated people. It has new playground equipment, new paint, a dance studio in the Big Room and the classroom looks bright and small child-friendly. There are even special science classes taught by the science teacher! It is good to see such an early childhood education jewel being carried on and cared for. After all — that is the tradition of Sunnybeam School .... an enduring, educational and caring place. And speaking of enduring, I still have my Sunnybeam sweatshirts on which is silkscreened the logo of Sunnybeam School. Jeans, a t-shirt and the sweatshirt were the uniform of the day when I taught at Sunnybeam. Nuki and I wore this every day. The children could buy a small size and they usually wore them to school. During the summers, Nuki and her crew would silkscreen the sweatshirts; some with hoods and some without. I don’t know whether or not that tradition has continued, but if you see one, you know that person has a connection to the little red school house on the hill--Sunnybeam School on Mercer Island.